The third and final concert in ZVO.ČI.TI So.und.ing DUO 2018 series. The performance took place on March 6, 2017 at Kino Šiška, Komuna hall. Recorded programme (each part approx. 20 min); - Irena Tomažin: No place same time, is improvised work based on the voice-sound vocabulary explored by Tomažin in last years of her work. It will be framed also by recorded material on tape recorders. 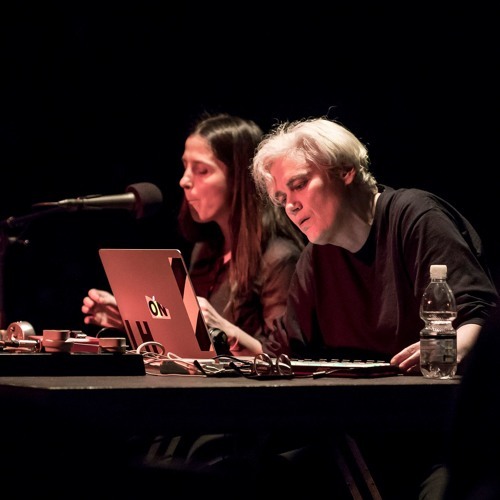 - Liz Helman – Irena Tomažin: Lines, Thoughts, Fragments (premiere work) Liz Helman and Irena Tomažin’s piece is a sonic exploration of emails and files exchanged between London and Ljubljana in 2016 and 2017. The work consists of processed field recordings, constructing an evocative, textured soundscape which takes the listener to another world of their own making. - Liz Helman: Same place somewhere The work consists of processed field recordings, constructing an evocative, textured soundscape which takes the listener to another world of their own making. ZVO.ČI.TI so.und.ing DUO is a series of electroacoustic performative sound events premiering works created in collaboration between a Slovenian and an international artist. http://www.cona.si/zvo-ci-ti-so-und-ing-duo-cikel-2017/ Curator: Brane Zorman Photo: Ales Rosa Produced by: CONA Institute for Contemporary Arts Processing Partner: Kino Šiška CONA program supported by the Department for Culture at the Municipality of Ljubljana, The ZVO.ČI.TI so.und.ing DUO series supported by the Ministry of Culture of the Republic of Slovenia.